Nike Golf Going Super Sporty for Spring and Summer 2015. Athlete Inspired, Create New Clubhouse Looks Sure to Turn Heads. Each season we have the chance to take a look at a few pieces from the men’s and women’s golf collection of apparel. It seems like each season, Nike Golf’, outdoes our expectations of what is stylish on the course. Each time we say there is no way they will top that look, well here comes Spring 2015. Believe us, there are some head turners this year. One of the major difference we see is that Nike Golf is going with more of a mainstream approach to their apparel this season and taking the feedback from top PGA golfers like Rory McElroy and Michelle Wie of what they would like that combines the off the course with classic on the course. For example the first piece we looked at this week while making a short trip to Florida, was the Nike Golf AW77 Full-Zip Men’s Hoodie. It is available in three different color combinations. Made with durable French terry fabric and raglan sleeves you will stay warm while moving freely on and off the course. A zip pocket at the sleeve keeps small items easily accessible. This is about as casual as it comes, but still fly enough to wear off the course as well. The AW 77 line has been a widely successful line of sweats and jackets for Nike during the past few seasons. With the addition of the jogger sweats to the fold of what everyone wants this season, why not add a jacket that looks good, but also performs on these early Spring Days. It is a very reasonable price of $80 so it won’t break the bank for quality and comfort. The hoodie construction is just enough material to keep you warm, but not to worry about the bulkiness of a sweatshirt. We also found it very easy to swing, even with the more slimming body fit of the jacket. They are very true to size. The hood is also very well constructed and fitted, creating less bulk that a lot of sweatshirts or hoodies are traditionally known for. 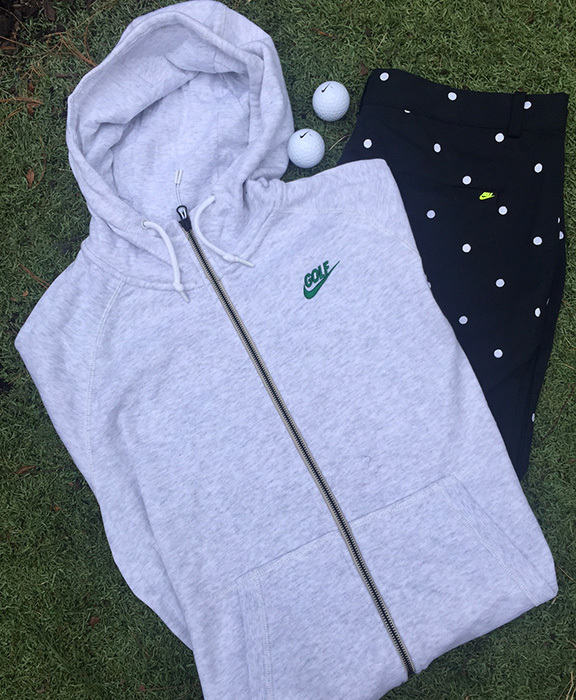 The best match we have seen for this hoodie were their Nike Print Woven Men’s Golf Shorts. Usually something with polka dots may not make the cut, but there style is just right. Designed with interior waist gripper tape and stretch fabric for a fit that stays in place and natural range of motion. These are a fitted cut, so they are less baggy than ever. Throw in the white matching polo with the AW77 hoodie and you are sure to be an instant fashion hit with your friends. We must admit, most of the Nike golf apparel sees just as much time on the course as it does off the course, so why not have a product designed to do both. Many of our staff members would purchase the regular athletic apparel, so now, it’s like two purchases for the price of one. These shorts are a must-have item for your golf wardrobe. The quality after a couple washes from dirt stains was as perfect as we expected. Their technology with fabrics and comfort is always amazing with their shorts. Another must have for $80. With the warmer temperatures right around the corner for most of the country, get those clubs ready, but before you do, make sure your outfit is right and see why the pros from Nike Golf always have the best outfits on tour.